The Elite EFF-20 ornamental aluminum fence features a flat top rail that is sure to give a very clean and stylish look to any property. This aluminum fence offers all the aesthetic beauty of wrought iron without any of the maintenance. Manufactured out of high quality aluminum, all Elite aluminum fencing is then given a powder coating that prevents against chipping, peeling, and cracking. To stand by the strength of this fence, Elite includes a lifetime limited warranty on all of their fencing. Is one of your favorite parts of getting a new fence sitting around and manually assembling all those fence sections? Of course not! Your new Elite aluminum fence ships as completely pre-assembled fence panels, taking all the hassle out of installation. 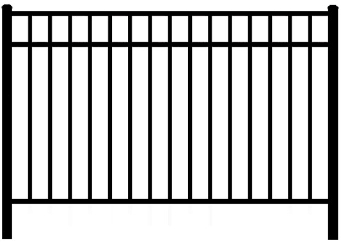 There is a variety of different Elite aluminum gates available designed to match each grade and style of Elite fencing. There are single entry, double drive, estate, and curved top gates, as well as their popular ZipTrack™ cantilver gate system. Elite aluminum gates include standard latch and hinges.